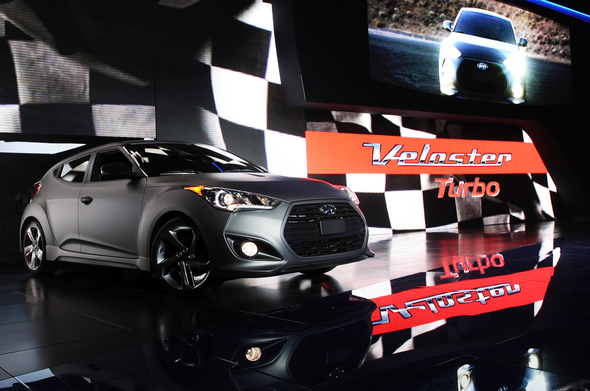 Posted on Sat, Jan 14, 2012 : 5:58 a.m.
Hyundai revealed the turbo version of its Veloster hatchback simultaneously at the Detroit auto show and in a "virtual showroom" in an X-Box video game in a bid to appeal to young car buyers. Automakers are scrambling to adopt new technologies and styling philosophies to appeal to young car buyers — part of a general realization that Generation Y, or Millennials, is an emerging force in the car market. That reality is plainly visible at the 2012 North American International Auto Show, which is open to the public Jan. 14-22 at Cobo Center in Detroit. The car companies are emphasizing their appeal to the generation of car buyers who were born after Jan. 1, 1980 — and not just because young adults will be car buyers for decades to come. Some young adults, in fact, have an ambivalent attitude toward cars, according to General Motors’ research. John McFarland, senior manager of global marketing strategy for GM's Chevrolet brand, said it’s important for Chevy to connect with young buyers, who are increasingly likely to say they don’t need a car. McFarland said GM connected with more than 9,000 young consumers over the past year — and only 42 percent said they were “interested” in cars. That’s about 32 million of the country’s 80 million young adults. It’s not altogether ominous news — after all, young adults generally can’t afford new cars anyway — but the automakers are serious about building their appeal with young buyers. The push to win the hearts of young buyers is just that — a drive “to capture their hearts” with “a brand that truly gets them,” McFarland said. GM’s drive to connect with young consumers is already visible. At the Detroit auto show, GM revealed the Chevrolet Tru 140s and Chevrolet Code 130r — two concept cars designed using feedback from young car buyers. GM’s focus on young buyers mirrors a trend in the industry — which hopes that vehicle connectivity systems will draw in young people who want to connect their digital devices to the car. By allowing young buyers to use social networking sites like Facebook and Twitter and listen to music using streaming services like Pandora, carmakers believe they can better appeal to young buyers. But connecting with young buyers is about more than new technologies, said Bruce Brownlee, senior executive administrator for external affairs at the Toyota Technical Center. On that note, Toyota placed special emphasis behind the price tag for the new Prius c, a smaller version of the company’s popular hybrid that will start at $19,000. The car’s alphabetical inspiration — the letter c — refers to “city,” where the vehicle gets 53 miles per gallon. Jim Lentz, president and chief operation officer of Toyota Motor Sales, described the Prius c as a “gateway vehicle” bringing young buyers to the brand. “The Prius c is sized, priced, styled and packaged to appeal to young buyers on a budget who quite frankly, until now, have probably found the hybrid experience out of reach,” Lentz said. To be sure, though, the car companies don’t have a uniform philosophy on how to win over young buyers. “I would prefer to think about the Millennial mindset, as opposed to a certain chronological age. One of the things that we find is if you’re focused too much on an age group, you’re going to make mistakes,” John Krafcik, CEO of Hyundai Motor America, told reporters. Marketing plays a particularly important role in reaching young buyers, executives say. Hyundai, for example, revealed a turbo version of the Veloster in a traditional news conference at the auto show while also launching a virtual showroom on the X-Box gaming system. Gamers playing "Forza Motorsport 4” can select the turbo Veloster when competing against others. When Chevrolet released the new compact Sonic vehicle in 2011, it embraced a “nontraditional” marketing strategy, said Mark Reuss, president of GM North America. “We’re three months into the launch and have yet to run a single television ad, opting instead for a strong online presence,” Reuss said. Sat, Jan 14, 2012 : 3:34 p.m.
(cross posted from <a href="http://www.annarbor.com/business-review/car-companies-new-problem-young-people-who-dont-want-a-drivers-license/">http://www.annarbor.com/business-review/car-companies-new-problem-young-people-who-dont-want-a-drivers-license/</a> ) Welcome millennials. Unless you're talking hight tech communications, entertainment or gadgets they're not at all interested in partaking in the rat race of conspicuous consumption that defined the boomer era (thankfully it's passing). Guess they see driving around all day to work or &quot;entertainment&quot; as wasting time and energy and want to spend their time differently. They're not going to be bothered with the auto show and they think the Dream Cruise is stupid. Go figure as you'll need to. Sat, Jan 14, 2012 : 12:30 p.m.
Gas prices have jumped approximately 50 to 70 cents a gallon in the last few weeks, this will hurt car sales,it appears no one wants to slow down to conserve fuel.